Ashley Wooldridge, senior pastor of Christ’s Church of the Valley, spoke about failure and how it’s not the end of God’s plan for us. 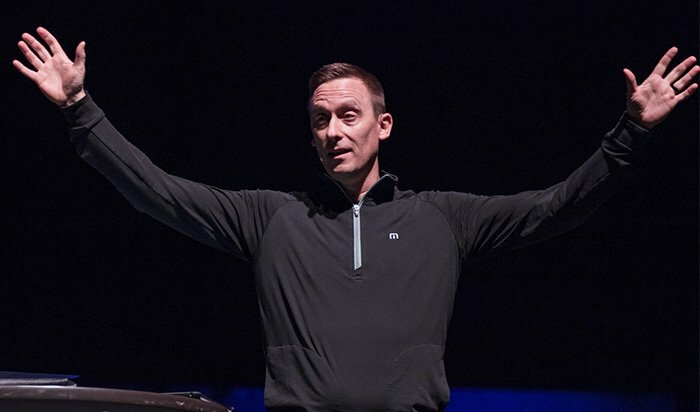 Grammar nerds had to have appreciated Ashley Wooldridge’s explanation of how God has a plan for our lives, no matter how much we might mess up — no matter how much we feel we might have disappointed Him. “Don’t ever use a period where God puts a comma,” he said. More plainly put, no matter your failures, God doesn’t stop believing in you. He always has a plan for you even though you might think what you have done has disappointed Him so much that He simply will stop using you in that plan. 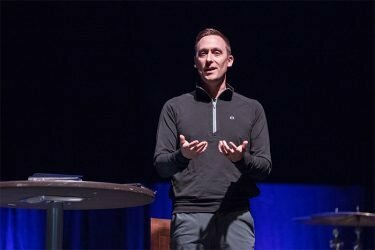 Wooldridge, the senior pastor of Christ’s Church of the Valley in Peoria, spoke about failure and those feelings of disappointment that may lead us to step away from Him even though one part of the Bible, John 21, illustrates to us that God is always with us. He started his talk by sharing with the GCU Arena audience that one time he was sure he disappointed God. It was while he was preaching at church. Wooldridge centered his talk on John 21. That’s when the stage manager walked out on stage – something he never does – and whispered in Wooldridge’s ear that his zipper was down. Wooldridge laughed, then asked what it is in your life you feel might be disappointing God the most. He said we all have these kinds of failures – whether it’s failing in school and disappointing our parents, or struggling with drug or alcohol addictions. Jesus gets the disciples back together and tells them to go out and change the world; instead, Peter decides to go fishing — and not recreational fishing. He returns to his old job as a career fisherman. “He’s going back to his old way of life. Why?” Wooldridge asks. They fished all night but didn’t catch one fish. 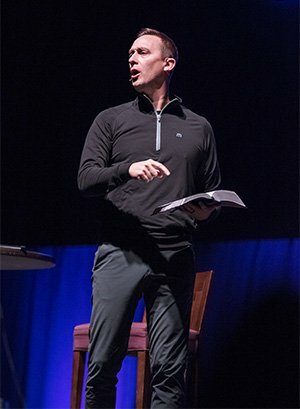 “Could it be Jesus wants them to know when you get off track with me, your life is going to come up empty?” Wooldridge asked. That’s when Jesus, whom the disciples didn’t recognize at first, had a simple solution – to throw the net on the other side of the boat. Their catch was so big they couldn’t haul in the net. He said it’s easy to get off track in life. It’s easy to feel disappointed and think that God feels the same. But even when you’re falling away, God is always close by, and it takes just a step, sometimes just the width of a boat, to get back to Him. Wooldridge also spoke about his own failures in college. Wooldridge grew up playing sports and put it this way: If you mess up enough times on the field, the coach won’t leave you in the game. You’re sitting on the bench. But that’s not what God does. In speaking with Peter, Jesus asks Peter three times to make sure he knows there is nothing that he could have ever done to pull him far enough away from God. 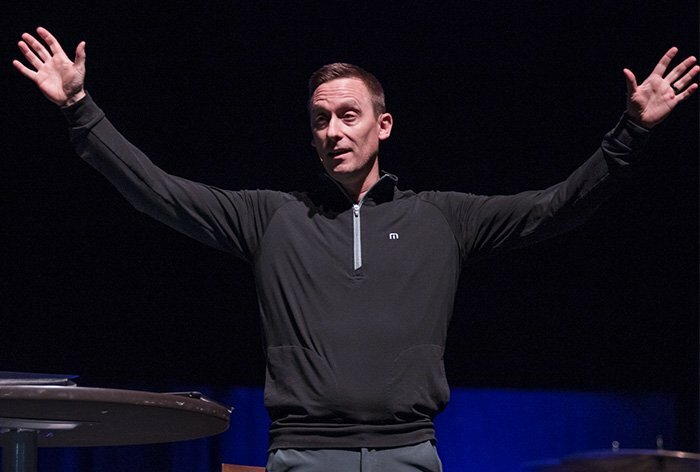 Wooldridge told GCU students that their generation has the ability to change the world but that it’s going to take some of them taking that small step back toward God to make that kind of impact. “Don’t ever use a period where God puts a comma,” he repeated. ● Next Monday: No Chapel because of the Presidents’ Day holiday. You can reach GCU News Bureau senior writer Lana Sweeten-Shults at lana.sweeten-shults@gcu.edu or by phone at 602-639-7901. Follow her on Twitter @LanaSweetenShul. I enjoyed this very much. Great points for reflection.